I read a post recently by Liz over at The Mum Blog and it struck a chord with me about a post I’ve wanted to write for a long time. Liz’s post is about the fact that she won’t be having any more children- something all women, one day have to come to realise. I always wanted four children, perhaps because I am one of five myself. I grew up in a big house with a big car and one bathroom. Chaos was always on the menu and as we were all girls, there was a fair bit of poster pinching and nail varnish snaffling too. My parents used to shop at the local cash and carry. There was always someone to play with, someone to share with and we had ‘sleepovers’ in each other’s rooms almost every night. That’s what I wanted for my children. Life doesn’t go to plan; I know that now. After the big one was born, I wanted another almost immediately. I felt guilty at this thought though, almsot as if I were betraying my precious girl for wanting another baby. I struggled with comprehending how I could love another baby as much as I loved her. When I finally fell pregnant with the baby, the big one was four and all my big plans of a huge family seemed to be slipping from my grasp. It had taken four years to be at a place where another baby was an option, five months to actually get pregnant- by this point I was 32. Getting old? My second pregnancy wasn’t easy and severe nausea lasted up until at least seven months; I started to rock sea-sickness bands with every outfit and was in bed by 9 every night. You know the rest. After he was born I swore I would never, ever do that again. Talking to my midwife counsellor, I realised that part of the reason why I didn’t love him striaight away was because I had compared him to the big one constantly throughout my pregnancy. It turned out that I actually couldn’t love another baby. Towards the end, I’d wanted to stay pregnant forever because I didn’t want to spoil my perfect family. After he was born, I was a wreck and filled with guilt that I had infact ruined everything by insisting on another baby. We were all miserable, weren’t we? 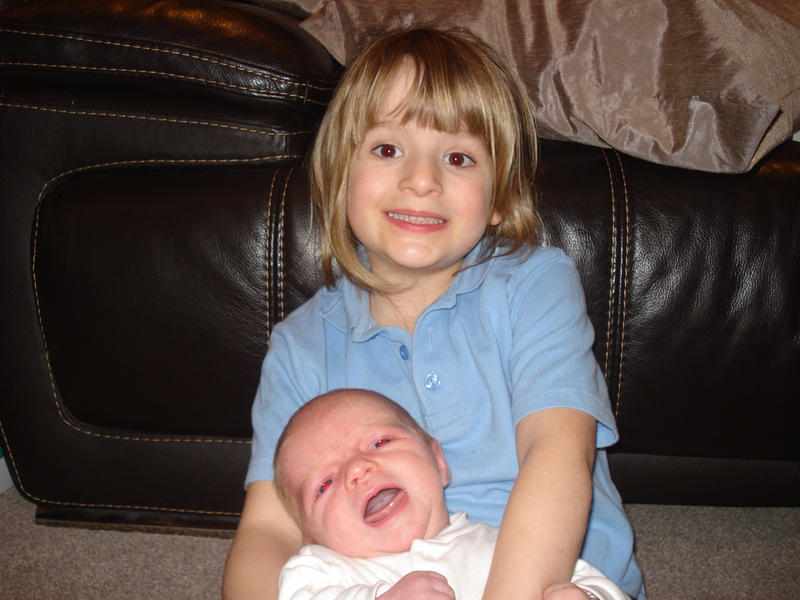 Looking back at pictures, the big one has loved being a sister right from the very beginning. They’re really good friends now. I want more. I’d do it all again in a heart-beat.